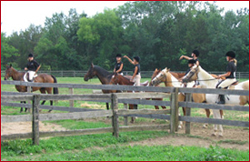 Tamarack Stables offers group, semi-private and private riding instruction for all ages and skill levels. The most valuable asset to our staff are our horses. We have over 20 school horses, one miniature horse and some privately owned horses. Our school horses range in age and ability from the professors, to babysitters to playful buddies, and teachable youngsters. Group sessions offer 10-13 weeks of instruction, with one, 1-hour-long class per week. Classes are held every day of the week. Most group classes have 5-7 student riders per class. Students must be at least 8 years old*. New sessions begin 4 times per year, but new students may join at anytime. We also offer special Home School group lesson rates. Check our schedule page for more information on class times. Review our guide to help assess the level where you or your child belong. Very little special equipment is required for students in order to participate. Please review our class requirements here. Private and semi-private lessons are available for one, two, or three students of all ages. Private lessons can be taken instead of, or in addition to, group lessons. Junior and Senior instructors are available for private lessons. Junior instructors are in training and are supervised by a Senior instructor. See lesson rates for details. Tamarack offers Spring and Summer camp weeks. Riding lessons, trail rides, crafts and a weekly horse show are all part of the fun. Learn more about Camp Tamarack here. The Tamarack Show Team allows for involvement beyond the weekly class for the eager rider, and provides valuable competitive experience for our students. 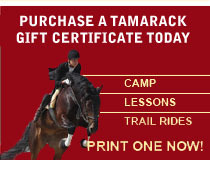 Contact Tamarack Stables for an evaluation or confirm with your current instructor which class is appropriate for you. Complete a registration form, and return with your payment to Tamarack Stables. *Group students must be at least 8 years old, but private lessons are available for ALL AGES!